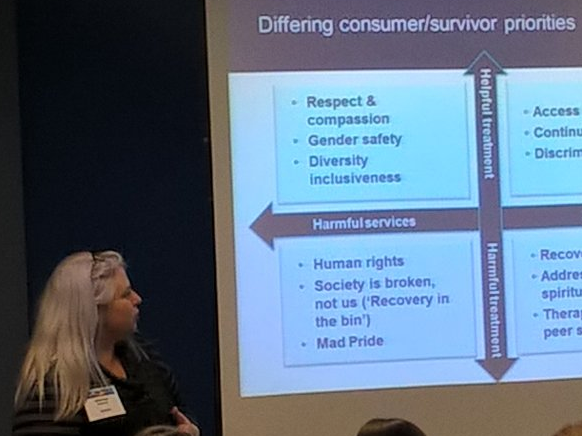 Above: Indigo Daya presenting her paper "The word is mightier than locked doors: Enhancing the Safewards nursing model with consumer perspectives" at the 10th European Congress on Violence in Clinical Psychiatry. The implementation of Safewards in Victoria is the world’s largest and most systematic program to date. In October this year, a contingent of Victorian Safewards trainers and researchers attended the 10th European Congress on Violence in Clinical Psychiatry (EVIPRG), to share with the international clinical psychiatric community the outcomes and understandings from the successful Victorian implementation. “Although the Safewards model is used in wards in several European countries, the Victorian experience is unique so far in that the model has been rolled out so systematically and on a large scale, and the evaluation of its impact has also been systematic”, said Victorian Safewards Evaluation Lead, CPN Director A/Prof. Bridget Hamilton. “To date, where Safewards has been implemented, it’s tended to be in small, local contexts like individual wards or single services”. Attending the Dublin-based Congress to present outcomes and key learnings from the successful Victorian Safewards trial were A/Prof. Hamilton, University of Melbourne research fellow and PhD candidate Justine Fletcher, DHHS-affiliated Consumer Advisor Indigo Daya, and Forensicare-affiliated researcher and clinical educator, Tessa Maguire. The Congress resulted in the inauguration of an international Safewards Community of Practice, to be Chaired by A/Prof. Hamilton, and incorporating membership from countries including the UK, Ireland, Germany, Denmark, the Netherlands, Canada, Finland and Poland. “My hope for the Safewards Community of Practice is that we can support each other in implementation and research. That is, we can collaborate on evaluation and share implementation resources, rather than reinventing the wheel”, says A/Prof. Hamilton. “The group will meet regularly online and may organise a Safewards event before the next EVIPRG conference in 2019”. The Victorian Safewards trial phase to 2016 involved the implementation of the model to 13 trial wards over a 15-month period. Post-trial evaluation showed a 36 percent reduction in seclusion events, significant adherence to the model during and immediately post-trial, and increased use of Safewards interventions at 12-month follow-up. The Victorian Government is committed to implementing Safewards at a further 58 mental health acute inpatient units across Victoria by the end of 2018, as part of its overall strategy to reduce restrictive interventions and promote a culture of safety and recovery. The implementation is supported by the Victorian Managed Insurance Authority (VMIA) and the CPN is conducting the ongoing evaluation.